The overall objective of the project is to catalyze the adoption of Sustainable Environmental Initiatives (SEIs) in key polluting sectors (urban transport and brick making) with a focus to abate air pollution and generate co-benefits through introducing energy efficient technology in brick sector and lay the foundation for introducing mass transit like Bus Rapid Transit in capital Dhaka. To enhance the capacity to anchor the implementation of various project components. Decrease in particulate emissions per brick kilns adopting cleaner technologies and practices of 20-30% by the end of project period. 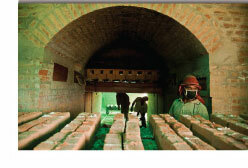 Reduction in the GHG emissions per brick kilns adopting cleaner technologies and practices by 15-20% compared to the prevailing baseline status. A 10% decrease in the number of traffic accidents in the project areas by end of the project. The recently completed Country Environmental Assessment, conducted jointly by the government and the World Bank identified air pollution as the leading cause of mortality and morbidity related to environmental issues. The health burden of air pollution has been found to be comparable to that of access to clean water and sanitation. It was estimated that if the exposure to urban air pollution were reduced by 20% to 80%, it would result in saving 1,200 to 3,500 lives annually and avoiding 80 to 230 million cases of ill health. Some other physical impacts of air pollution include damages to crops and ecosystems, degraded visibility, soiling of buildings, and damage to water quality through air deposition of pollutants. These effects on the ecosystem impair people's livelihoods as well as their health. The project comprises two components: (a) Environment, and (b) Transport.